Thanks for this fantastic update Robert. I thought you might be interested in a fresh sea level rise graph. It looks amazingly similar to the temp gradient! Absolutely unbelievable things are we seeing lately. Terrifying is not an exaggeration at all. Yes, this is all ridiculous and crazy including the fact that NPR is hosting links to AMEG’s call for geo-engineering. I was worried about this some years back when the Economist wrote an article alluding to geo-engineering. Looks like there are a lot of powerful players trying to push that. To be very clear this is more a defense of the failed free market than anything else. The required response to reduce carbon emissions would have a serious impact on neo-liberalism and the current market system. So we may start to get more of this voodoo climate engineering stuff in the pipe. I don’t like it and I don’t support it. The only responsible thing right now is to push hard for rapidly lowering carbon emissions and getting whatever atmospheric capture regimes cobbled together that we can. That solar radiation management and ocean seeding AMEG is pushing is bad, bad news. – “Geo engineering” our way out of this is not a realizable option for stopping this anthropogenic engineered carbon furnace. Prevention via a steep lowering of fossil fuels is the only option to at least slow the heating. Keep it in the ground or we go down –our children — all of us. Thanks for the straight talking post, Robert. And you’re right, free market has got to go. Look at the model studies… Solar radiation management generates droughts that adversely impact upwards of billions of people. Ocean seeding accelerates ocean death. All on the off chance that it might work and take out some of the warming or some of the excess carbon all while not doing a thing for other impacts like ocean acidification. I think anyone who looks at this as a time-buying measure isn’t really very well informed on the risks vs rewards here. In any case, the curve is steepening. Jumps from 3.32 to 3.34 mm each year over just the past few months. Yeah, and if you start before that dip in 2011, you get a 4.4 mm per year rise from 2010. Looks like that glacial melt is becoming a bigger factor. Several months back I saw a comment saying , “The West Antarctic Ice Sheet, doesn’t care what you believe”. That’s what get’s us down . It’s this giant cake we’ve baked. If it was just a matter of how many angels we think can dance on the head of pin, that’s one thing that can go on forever, but the physics doesn’t care either. I wish I could take walks as well. But as Steely Dan said, “Those days are gone forever , over along time ago.” So I’m stuck with U-tube to clear my head. It’s the best treat for my “black dog”, that and Old Milwaukee & guts . I’m in my second decade of this story. Some days it feels like chips of me are being knocked off like a calving glacier. It is the biggest story in the history of man . And it won’t go away because we find it so over powering. So. there is only one thing to do, Face It, and carry on. Biggest story in the history of man is about right, and we are going to have ringside seats. So it looks like a similar jump in the GISS measure would be in the range of 1.2 C above than NASA baseline of 1950 to 1981. This puts us in line with about a 1.05 C to 1.1 C above 1880 but may imply as much as a +1.2 C above 1880 for 2016. It’s a new record range that we’ll explore the impact of at least until the next El Nino, considering the strength of the current one. But it implies that just one more strong El Nino could tip us into near the 1.5 C range. The oil industry has scrambled to transport crude oil from drill sites to the east and west coasts, where it can potentially be shipped overseas to more lucrative markets, as hydraulic fracturing and tar sands drilling has created a glut of oil. The increase in oil rail traffic, however, has not been matched with increased regulatory scrutiny. 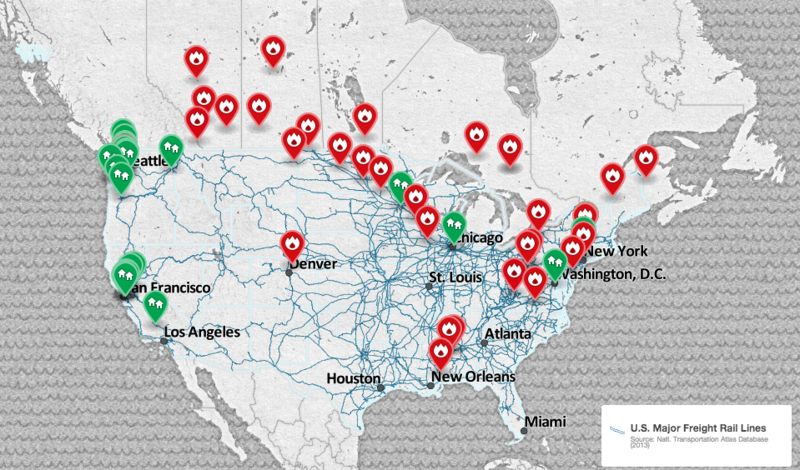 Oil trains are not subject to the same strict routing requirements placed on other hazardous materials; trains carrying explosive crude are permitted to pass directly through cities—with tragic results. In the absence of more protective regulations, communities across the country are beginning to take matters in their own hands. 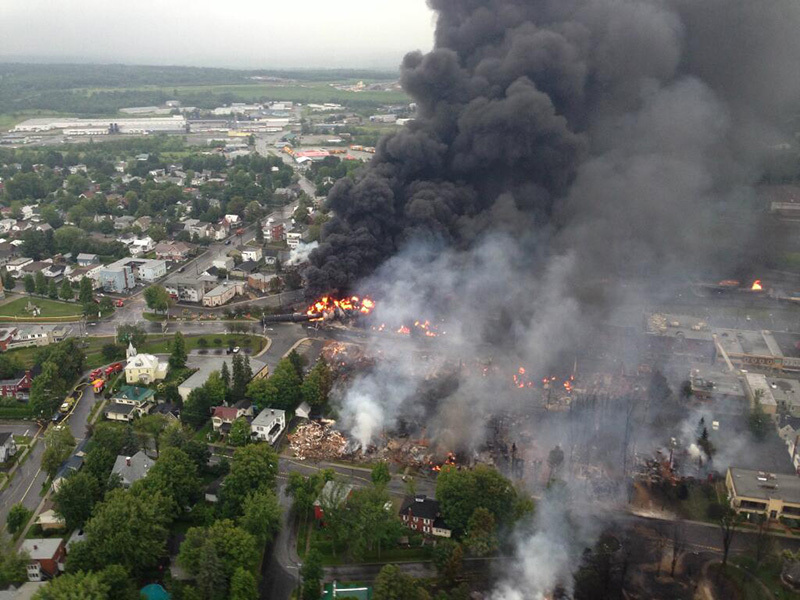 – The crude oil train explosion in Lac-Mégantic, Canada, killed 47 people. Not sure if you can or want to do anything about it, but something happened overnight and your blog name in my RSS feed isn’t showing any more, it is the headline of the first post today. Just an FYI. Sorry, but I can’t do too much about the internal RSS feed. You may have to subscribe and then unsubscribe. It may be a glitch or it may be something else. But nothing here on my end. The Keeling Curve just Tweeted this out a half-hour ago. The website does not have the daily reading and I don’t know how to copy the whole tweet but my goodness, that is a big jump! This is an absolutely brutal jump. We’re already hitting the peak daily range for spring of 2015. And it’s just January! We may hit 407 to 408 by April at this rate. Been watching it for a 403 breach – Nature springs a surprise! Won’t be the last one. The only geo-engineering that I would like to see is the planting of trees, by the hundreds of millions and the re-instatement of bogs both of which take up and store carbon. The UK is currently losing millions of tree to disease. There are incredibly ancient yew trees in Wales, usually growing in next to old churches which themselves have been built to incorporate stone circles (Ysbyty Cynfyn, Ceridigion). The trees have witnessed such momentous change that it is hard to imagine, I just hope they can continue. What is this claimed being based upon? If winter is this warm – and we’re seeing startling changes in the Far North, then what will Spring thru Fall bring? And as an added question, isn’t the 1.2C estimate also far higher then what everyone has been expecting? This is a huge jump for even one year – and guesswork right now – since we won’t know for another year if this estimate is even true. If this huge jump is repeated next year (yearly average), then it won’t be 2050 before we see 2C. We are at the top of the natural variability scale for now and the next 2-3 months. As El Niño fades, the heat forcing blowing off the Equator will decline and global temperatures with it. But we will be entering a new high range, exploring new and fearsome climates. There’s the off chance that this El Niño hangs on and re-fires by next fall. If that happens, then we may see 4 back to back record hot years. But considering the intensity of this El Niño and the strength of the current heat spike, that’s somewhat less likely and we only have a hint of it in the models at this time. If we go by reasonable worst case emissions and climate sensitivity, we could hit 2 C by 2036. The other stuff is far less likely but worth watching in any case. This “El Nino heat” in the equatorial Pacific is eventually been reased into the atmosphere. If I have got this right, this heat is tranported towards the poles. This must have a great impact on the temperature in the coming melt season in the arctic, specialy as the temperature is already pretty hi. Svalbard has currintly 30 days average 9,7C above normal. Absolutely. That El Nino related heat spike will head poleward over the next 2 years — more vigorously if we go into La Nina. So we should see increased impacts in the Arctic during 2016 and 2017. We may get a stronger amplifying feedback signal — accelerated sea ice melt and potentially more clear signs that the carbon stores there are under increasing heat pressure to release. We should be clear that the carbon store release signal is starting to show up in some of the monitors. A signal that is now cause for much debate among scientists. Some believe the signal is not yet strong or clear enough to yet show a clear indication of feedback response. Others are afraid that this feedback response will be catastrophic soon (and seem afraid enough to recommend the application of Frankenstein geo-engineering). There’s a middle group that sees feedbacks ramping to 10-30 percent of the human emissions by end century. To be very clear, the signal in the Arctic is nowhere near 10 percent of the total human emission now. The potential 34 MT methane emission ongoing there now is less than 1 percent of the annual human addition to total global heat forcing. And a significant fraction of that emission has almost certainly been ongoing since the start of the Holocene. The CO2 response is also slowly building and troubling. But even combined, the human emission just dwarfs it. So we’re at the start of these troubling amplifying feedbacks that look like they will make our situation even worse. And as we push warmer we are more and more in the danger zone. To this point, we should be very clear on the fact that the human emission is amazingly destructive at this time. We are at least 6 times faster than the Permian at this time from human emissions alone and it is unlikely that even the absolute worst case carbon feedback will equate to any more than a fraction of the current human emission. In other words, we have the equivalent to a clathrate gun or two firing off right now. But it’s coming from tailpipes and smokestacks. I think that’s the message we need to be repeating. Nature just can’t match us when it comes to the speed and efficiency with which we are dumping hothouse extinction gasses into the atmosphere. Remembered Michael Mann’s Scientific American article on reading this blog. Looks like he may be right, not for the first time. That’s exactly what I was alluding to. It seems to me we may be on or near enough to the pathways Mann charted. We wrench ourselves off it somewhat by bringing emissions to zero ASAP. But this isn’t something we should be holding off on. We should be going at it full bore. anyone have any juicy quotes of the folks suggesting that there wasn’t any warming in 17 years? I have noticed a bit of silence from deniers like Alex Jones at prisonplanet. They’ve moved on to trying to spin COP 21 in order to attack desperately needed emissions reductions. That, and spewing all kinds of smoke and other distractions pretty much everywhere. I’m really hoping that the tide is turning. This may be borne of desperation, but I have noticed a drop off in the UK since the record smashing floods. I had a good look at the comments on CC stories at the Daily Heil (Mail) and the Guardian a few days ago. It may only be a temporary thing , but I did detect a shift in the ratios of comments from either side. One day sooner or later, reality will hit home for the great majority. There can’t be many new deniers jumping on that rickety bandwagon at the moment, and there are going to be people going the other way, in the face of recent events. Thanks for the strong worded narrative on the latest JMA report, agree it is terrifying, amazingly in a heatwave in Sydney yesterday, companiese just turned their A/C’s up and people complained of the cold, and needed warming drinks. If there are any science communicators reading, please, PLEASE stop using the word “may” or “could”. It conveys a possible minuscule to a large likelihood and destroys any meaning at all, and is extremely lazy. People will just not care unless they know the true risk. the word “may” or “could”. I’m in the same camp . I hate this media phrasing . Like it will turn “cool” tomorrow. “People will just not care unless they know the true risk.” – thats what I thought 10 years ago, when I started educate on risks of climate change. No I have grown up. People simply dont care no matter what. It is not communicators fault. We tried everythink. Firstly much kudos to you for educating people on the enormity of the impact burning fossil fuels for so long has had on Earth’s natural systems. Secondly I am “people”, I am not a scientist, just a very plain, ordinary and average person. Science reporting matters to me and I suspect many others who read this very same blog are just ordinary folk like me. I care so do others (Colorado Bob cares, I care). If the NOAA study example I attached in the next entry was titled, “Advanced Technology Projects Northwest Atlantic Ocean WILL Get Warmer, and Sooner”, it would have had a much greater impact on me. I read the latest Potsdam Institute narrative on the suppression of the next ice age, it is good, it is positive it will affect the way people think. There is no weak “MAY” in the title. It has had a great and shocking impact on me, it brought me to tears, and brought home the enormity of our actions. I visited a glacier in the South of my country (New Zealand) in the mid 1990’s, the glacier will no longer exist well before the end of the 21st century, my great grandchildren will not witness it’s beauty and wonders. I count myself truly privileged to have seen it. I’m with redskylite. If you’re going to take the time and trouble to try to communicate, word choice matters. I’m frankly partial–would like to see more selection in choice of stories. I try to only tweet the ones that I think will help move people to get involved–if they don’t (one recent example is the one about Antarctic icebergs helping reduce warming), I give them a pass. Word choice does matter. Absolutely. But you can’t say that something is certain when it isn’t. I’ve longed thought scientific reticence is not our friend. I get the sense people here in the UK hear the caution and think yeah, like they said we “could” have flying cars by 2020 or safe nuclear power too cheap to meter. I agree 100% with Spike, it is exactly what Watts, Curry, Spencer, Christy and co prey upon, it’s kept true Science down for years. Hey Science guys please lose the reticence. If it’s above 50% chance, it’s going to happen. Flying cars, webbed feet, fantasy, no ice age fact, Earth science disrupted, purple sea and green skies here we come . . .
What Spencer and Christy and Co do is actively misinform people by producing bad information. If the scientists have failed, it’s in the fact that they have not attacked these people’s credibility and just allowed themselves to be put on the same stage as quacks operating under a special interest’s agenda. For example, it’s not too hard to identify Spencer and Christy’s information sources and funding sources. I think those two things alone should disqualify them from being creditable in this debate. People say it’s impolite to target credibility. Well, that’s pretty silly. The first thing you do when you’re doing research is considering the source of the information and the past quality of material that source has provided. If Spencer and Christy, for example, aren’t credible because they’re using funny numbers to manipulate the satellite data, then that information should be held front and center. How many years has it taken us to talk about that? How many years has it taken for us to talk about Spencer and Christy’s links to fossil fuel funded think tanks? And you can’t lay this all at the scientists’ feet either. It is often the responsibility of media to accurately vet how issues are presented. So, in my view, the media bears far more blame than scientists. For example, if media keeps asking the question to the scientist — ‘can we prove that this storm came from global warming?’ Then the scientist would dutifully answer that no single storm can be completely attributed to global warming. The reason being that the clarity of science in most cases is not fine enough to prove that one storm came from global warming. It’s not really the scientist’s fault that he technically answered the question correctly even though he gave the wrong impression. We know now how to communicate this bit. We can say that global warming impacts all storms and that weather change is climate change and vice versa. We can say that global warming fundamentally changes weather, not just by temperature increases, but by adding 7% more water vapor to the atmosphere with each 1 C warming. By providing more latent heat that aids in the generation of storms, droughts, floods and fires. But the media, in asking this question, put the scientist on the worst ground possible to give a good, contextualized, answer about the impacts of human forced climate change. And the media should have known this from jump. These are examples of certainties that can be communicated truthfully and accuratedly. But this notion that we should communicate potentials as if they are a certainty is just barking up the wrong tree. A potential is a potential. A certainty is a certainty. Saying that one is the other is not telling the truth. That’s easy to say redsky and I understand your frustration. I like certainty too and I do my best to generate it along with as much clarity as possible while still remaining truthful. But the problem is that we are dealing with potentials here. We are forecasting things that have never been forecast before. If you expect one hundred percent certainty, then you expect godlike omniscience. Science is a good oracle, but it’s not a perfect one. So, when you identify risk, the phrasing is important. For example, when I say we may see 1.2 C above 1880s values in 2016, that’s a very real risk now that people need to be aware of. And it’s far more accurate than those people who are saying with fake certainty that the world will end in 15 years for human beings. Now there are some things we can say with a strong sense of certainty, because we have a strong support for them. Things like we’ve pushed ice ages back by 100,000 years even if we stopped emitting now (unless of course, emissions go net negative for long enough). Scientists have been saying this for the better part of one and one half decades now. Hansen, for example, indicated in the mid 2000s that just one coal plant continuously operating would be enough to prevent another ice age. And if you made a careful read of Storms of My Grandchildren you would have known this. But when you deal with many, many forecasts, you’re dealing with the likely vs the unlikely. You’re dealing with scenarios. And that’s why you need to listen very carefully to those of us who say ‘may’ and ‘could.’ Because they’re far more likely to be informative than those poor, ridiculously assertive souls who are so often very, very wrong. And it is absolutely, positively not reticence to identify an outlier risk in this context. The reason being that you need to look both at the worst case and at the least likely events. At the most likely and the least impactful. And at as many ranges in between as you can generate. If you don’t understand this kind of threat matrix, then you don’t understand risk or communicating risk. But I can say with every certainty that if I say we may have 1.2 C warming next year, then you’d better sit up and listen. That it does have meaning. And that you’d be pretty foolish to ignore it. To this point we should think very carefully about why science is such a useful tool. And that’s because science is constantly refining itself, questioning itself, vetting itself to come up with ever more accurate answers. Science is flawed because it is made up of flawed human beings in a flawed world in a universe that would not exist unless it was flawed. But without the painstaking care of science not to jump to the wrong conclusion, not to make the false assertion, we would never have known this. “As scientists, it’s a little humbling that we’ve kind of been saying this for 20 years now, and it’s not until people notice daffodils coming out in December that they start to say, ‘Maybe they’re right,’ ” said Myles R. Allen, a climate scientist at Oxford University in Britain. I spent a whole career explaining complex science to lay people and you had to be direct, short, and keep it simple, remembering that many in your audience had very little education and that even the well educated often had a huge blind spot where science is concerned. There is also the phenomenon of ESLD as explained by Sk Science. This is appropriate for most science but arguably is inappropriate for a time limited problem of existential nature for humanity, nature and infrastructure. We would not hold back on the directness and vigour of advice to someone who had had a few drinks and decided to walk across the motorway to go home – it’s unlikely we would wait to compute the precise nature of the risk based on traffic density, speed and light levels and say “we’ll get back to you”. There’s that may word again, good research & article otherwise . . . .
“A new study by NOAA researchers suggests future warming of ocean waters off the Northeastern U.S. may be greater and occur at an even faster rate than previously projected. See the new lady up thread that told us about sailing South against the Gulf Stream in November. Sorry dear , I forget your name but your post about the loop you used to ride South stuck. I’ll go look , but I’m up and have bit in my teeth tonight. So I’ll make it right soon . Yours was a great story. I grew up on a high pool table. I ran off to 10,800 feet . We did a winter there, This whole mountain man myth is why guys with guns took over a much lower piece of ground. The only thing that lives all winter long that high are Pine Martins. And they break into your cabin , and pee all over everything. And it stinks like you have never seen. They are in the weasel family their urine will take the top of your head off. Good by to any remaining cod off of Cape Cod… and Maine lobsters eventually. It’s just one model forecast covering 80 years. Use of the word ‘may’ here is entirely appropriate given the fact that model resolution is far from perfect. You’ve got to understand that we are making predictions for complex, very complex systems here. The magnitude of the task is extraordinary. May, potential and likely are responsible uses here. Sailing upon a doomed ship made from the carcasses of the dead. I can think of no better metaphor for a civilization that continues to burn fossil fuels. The dead being the already massacred, and the far worse massacre to come if we continue as we are. May i suggest a quiet different clip that may describe how humanity reacts? Rapid carbon emissions reductions to net negative = lifeboat. It’s really pretty simple. Denial of that is part and parcel of climate change denial. – The tall masts were made from Douglas Fir trees that held sails and rigging made from the hemp plant. Then we’re even worse than poor Ahab. Some thoughts about the graph. From 1890 to ~1984, while there’s a steady increase in average temps, the very low years (relative to the long term linear trend) are approximately evenly distributed in number and magnitude with the very high years. This says to me that while average temps were rising, global climate stabilizers – ocean, forest, ice – were stochastically counterbalancing rising surface temps. Then from ~1984 to present, the antipodal lows disappear. Completely. This is a thirty year trend, which means it’s the new normal. So from 1890 to ~1984 there’s a true linear trend; from 1984 to present, especially given 2015 and probably 2016, it’s no longer linear. It’s certain we’ll see cooler Decembers than 2015-16 again. It also appears highly likely we’ll never again see Decembers cool enough to counterbalance peak warm years. This reinforces climatologists’ warnings for years now that the really important temps to watch are the lows – the ongoing huge increase in record high lows and dearth of low lows. This matches my own observations here in Austin – my graphs of high lows show a non-linear increase in temps. So apart from the striking spike in 2015 global December temps and probable matching or higher 2016, it appears that global climate stabilizing systems are increasingly unable to counter AGW. (No surprise, given the state of Arctic and Greenland ice, deforestation, ocean warming, permafrost melting…) Further, this is December, when boreal winter is supposed to have settled in. That’s gone, not en toto but in effect. Which brings another point to mind. We may be overfocusing on overall global temps, when the important data may be hidden within the approbated discussions of “2C”. To my eye, while it’s only one month out of the year, this is a system fixing to shift into non-liner increase, and perhaps has already done so. First, if there’s no longer the “sea anchor” (so to speak) of cold winters to counter peak highs, this itself implicates system destabilization. Second, as everyone knows the coldness of Earth (in all its forms) has locked in it immense amounts of carbon. Combine these and you don’t get a reassuring picture. Once again, Hansen was (back in 1988, right when this shift began) relaying the most accurate narrative picture of the data. Also Robert, noting the “disappearance of winter.” What I think might be missing is a granular look at the data, and how this might be an important, even vital perspective currently overshadowed by a necessarily ‘global’ outlook. Steven Blaisdell what a crazy place. this is , you are doing expert thinking . and I’m trapped on the Pequod. leaving New Bedford. Thanks for this Steven. You really explained your point well and sure have got me thinking. Scientists say that a major step change, or ‘regime shift’, in the Earth’s biophysical systems, from the upper atmosphere to the depths of the ocean and from the Arctic to Antarctica, was centred around 1987, and was sparked by the El Chichón volcanic eruption in Mexico five years earlier. The kegs in this movie are 42 gallons. That’s what whale oil was shipped in . Today when you read about a barrel of oil it’s 42 gallons. The first oil workers at Col. Drake’s discovery were whalers. The theory at the time was that he had found shoals of whales buried in the flood from the Bible. You go to , Titusville, Pennsylvania. Or spent 3 years on a ship ? This was birth of the modern oil business. But this was our energy history. It made us rich. We lite the world, with the death of these great creatures. and no movie ever painted that time and place like this one. The story is much older and deeper . The whales used to come really close inshore, in the thousands. And like the bison , we killed everyone we saw. Then we elected Teddy Roosevelt. And the world changed. It seems that the big banks (and the CBA is the biggest one here) are getting very concerned about lending against fossil fuel based investment. Waylon Jennings traded his seat on the plane that killed everyone on Buddy Holly’s plane. Ted Cruz was born in Canada , I was born in Texas. His wife got a 2 million dollar loan so he could run for the senate . From Goldman Sachs, and Citibank. A truly a man of the people. You have to wonder about a system that encourages people to go into a 2 million dollar debt to get a job that pays far, far less. Obviously, something is seriously, seriously wrong. Oh look, another mass die off. Tens of thousands of dead birds are washing up on the beaches of Alaska’s Prince William Sound, an unexplained mass die-off that some experts say may be related to the changing climate. Basically these are diving sea birds. Climate change has driven their food source away, thus they starve. Another example of extinction climbing the food chain. It appears others are starting to connect these dots as well. I posted the same story. Several days ago. except this die off is in Prince William Sound. Your article never says one thing about it. It has never recovered since the oil spill. and the crash of the of the small fish. If I read your story it’s a one off event . Not a system that has been punched in the gut. It’s amazing how poorly these people write articles. With zero memory. . I think the person that wrote your article never heard of the Exxon Valdez. This is why old people refuse to die. Because young people have the wisdom of gerbils. But if we just clap our hands , to the same stupid beat for the last 20 tears. Another Honor will surly come our way. 20 tears is not a typo , it’s a wish. That is why we look beyond the headline or the one-off story. We are the ones who connect the dots. It makes sense that the Valdez weakened the locale making the food chain more vulnerable than other fjords. Prince William Sounds weakness is not just the Valdez, nor climate chain, rather it is both. It does serve as a canary in the coalmine for the rest of the coast in that region. Oh look, yet another mass die off. Thousands of squids washing up on the island of Santa Maria off the coast of Chile. I’m a non-expert. As I understand it “upwelling” in this region at this stage of ENSO typically leads to increased fish stocks. Terrible, heart wrenching. When you realize what we’re doing to the innocent creatures of our world it is a callous heart indeed that would recommend a continuation of this terrible burning. This ongoing dumping of a poisonous level of carbon into our atmospheres and oceans. The explanation doesn’t fit the event. The looks like many of the dead zone related events we’ve seen during recent years. I notice purple pigmentation on many of the squids washed up as well. For my part, I tend to think anoxia, possibly hydrogen sulfide production when I see something like this. If you’ve got an anoxic bottom zone that upwells, if the bottom zone is more anoxic than before, then you can have a pretty serious impact. We’ve already signed many cetacean death warrants. And these beautiful creatures are in big trouble. Seriously—– that expression drives me crazy. I see it/hear it often. It feels (to me) like a flippant, almost robotic response to human induced mass extinctions. It smacks of a complete lack of compassion for all the creatures humans are knowingly killing through egocentric fueled short term thinking. To frame the death of life on earth in such simplistic terms, one must be devoid of empathy (like a meteor, for example) and have the ability to objectify the biosphere. Thanks for the link Spike (and CB and others)—–although it is getting more and more difficult to process the level of suffering and the number of deaths caused by pollution, habitat destruction and AGW. Joanna Macy’s work helps . . . . I think what you say at the end here is very important. It is all too easy to withdraw into shock. We should be very truthful to ourselves here and do our best to see what is happening with eyes unclouded. Robert, you talked a bit ago about keeping this site positive. Robert, keep slugging away, it is appreciated muchly by all of us lurkers. And especially appreciated that you do the diligence to keep the trolls away. Honest insights and opinions are welcome. It’s people with an agenda that clouds the call to moral action that we’re supporting here that I tend to take down. Ironically, once they’re gone, the site tends to flip back to positive. Just because I think you were reffering to one of my comments (thank you, BTW), I´d just like to clarify that I´m a woman, not a man 🙂 . You’re an example to us all, really. The worst happened and you kept on going. That’s the kind of pluck we’re going to need to get through this. Heartily agree with your post Jeannie. Thanks to Robert and all who post here. Hear, hear. I used to keep up on sites which took allcomers (RC), but when I go back now I just can’t believe how much wasted energy is involved arguing with (what are essentially) trolls. Although I had a bad (negative) few moments a week or two ago, and gave myself a needed time out (out of respect for all here), it made me think hard about this place. – Some of the best sailors were the who could not swim — but would do any, and everything possible to keep the ship afloat. If I know one thing about the ocean, it is that she keeps far more secrets than she ever gives up. If we have seen a truly staggering amount of die-offs from our vantage point, the true scope is likely far worse. Haven’t we? That’s news I follow – and what I’ve seen is quite staggering already. It’s been attributed to starvation, toxic blooms, pathogens and ‘unknown’ mass mortality events. The oceans are dying right before our eyes. Ocean health is crashing. We won’t have a living ocean of the kind we’re used to by 2040 if we keep this up. I was gobsmacked by that graph, with such a large year-on-year increase. Although it was not the largest jump on record, it was from the previous record warm year rather than an unusually cold year. The 1.5 C “Paris limit” looks like it will be met before the end of the decade. Once again the laws of physics trump-sorry for using that word-the BS of denier politicians. OK. Let’s be very clear here. Though there’s an outside possibility that annual average temperatures hit the 1.5 C limit by the end of this decade, that’s less likely. More likely is that these average out into a number of years that range near or just above 1 C, with the peak year being around 1.2 C (which may well be 2015-2016). If PDO remains positive, then we would be in reasonable danger of hitting annual averages of 1.4 to 1.6 C by or just before the mid 2020s. Rapid emissions reductions could help to mitigate this potentially very rapid pace, and are the most reliable means of preventing ramping heating and ramping impacts from heat long-term. This is a post from Robertscribbler, who has been writing authoritatively about climate warming for quite awhile. If you’re not up on the lingo, we’ve spiked from .85 degrees c above the baseline temperature (pre-Industrial revolution) to 1.4c in December. It might be temporary (due to El Niño), but this means we’re already about to hit the ‘preferred’ 1.5c limit on temperature rise recommended by COP21 Paris activists. So we should be very clear about this point. Hitting 1.4 C in a single month is pretty amazingly bad. But we are still probably in the range of 5-20 years to hitting near 1.5 C in the annual average. The reason is that though the human forcing is ridiculously strong, natural variability can still wag the tail a bit. And we are at the top end of a record El Niño in some measures. We’ve hit the crest of the natural variability wave and we’re doing it with CO2 in the range of 404 ppm and CO2e in the range of 485 ppm. Sadly, over the next decade, I fear we will start to begin to understand the true meaning of extreme events. Hitting solidly in the range of 1 to 1.5 C will start to bring some of the catastrophic impacts into line. It’s nothing like 2 or 3 or 4. But this is starting to get serious. Thank you for your correction. I understand that the 1.4 may be a one-off owing to El Nino, but the fact that there were people at Paris saying we should head off warming above 1.5 and then have the 1.4 number pop up so quickly, gave me quite a start. Thank you for your work. Sadly, Paris has turned into a bit of a political football. This is not a surprise owing to the previous responses to climate summits and to all the misinformation and confusion that tends to surround each new IPCC report. So it’s worth pointing out that even Paris noted that we will probably not be able to keep warming below 1.5 C. That we’ll probably pass that and have to try to immediately bring temps back below that range. This is a bit more responsible. However, my opinion is that we are looking at warming in the range of 2 C this Century even if we bring emissions to near zero soon. In my view, the only way to miss the 2 C target is to be net negative carbon emissions within a few decades. This, of course, is not a sudden switch that magically happens in some single year three decades from now. But a rapid move to reduce emissions to net negative starting immediately. Not in 2020. So I think this general understanding among many scientists including Hansen is what’s causing ire over COP 21. You can’t reach the stated goals with what’s been committed. And unless you start the rapid carbon reductions sooner than 2020, you’re looking at hitting 2 C warming relatively soon and probably still before 2050. If you look at the Mann climate sensitivity paper we are between 22 and 30 odd years away from hitting 2 C on the current path. I think the focus should be on getting off that path as rapidly as possible. COP 21 moves us off that path. But gradually. Too gradually. So the urgency now should be for strengthening those emissions reductions. You wrote here that we are in the tail of end of a natural variability wave, and for El Nino that’s true, however Trenberth has said he believes there is about a 67% chance that the PDO has switched into a positive phase, and the positive phase I believe is expected to last about thirty years. So, we may be entering a time of accelerated warming just now. Absolutely. With the positive PDO, we’d tend to see more overall warming and likely more potent El Ninos. But even so, we’d tend to back off the peak of this El Niño for a bit and probably until the next El Niño. The jump from this El Niño is quite intense. Also, as I did mention before, we have a few rather disturbing models showing the current El Niño may recover again. That may be the PDO signal showing up. In any case, the Pacific heat signature now seems to indicate that Trenberth, as usual, is quite solid in his assessment. Looks like this one is settling in for the long haul. It’s worth noting that the last positive PDO cycle pushed one decade warming on the order of 0.3 C. With quite a bit more heat forcing in the atmosphere now, I wouldn’t be too surprise if we hit 0.4 or even 0.5, which does put us in the range of 1.5 C by the mid 2020s. I don’t want to see that. But there’s every indication it’s a distinct possibility. Yeah. What you going to do? I think some of the deniers are starting to flip into rage … I find it funny that the work I do, mostly for no income whatsoever, is attacked. Apparently any charitable effort to help others and the endangered creatures of this world is something that those like Callaghan equate to ‘evil government conspiracy.’ It really saddens me to see people whose minds have been shrunken in this way. To be reduced to maligning the very hand that reaches out to help. But, I suppose I shouldn’t be too surprised, it’s the terminal near death response of heroine addicts everywhere to refuse help until it kills them. 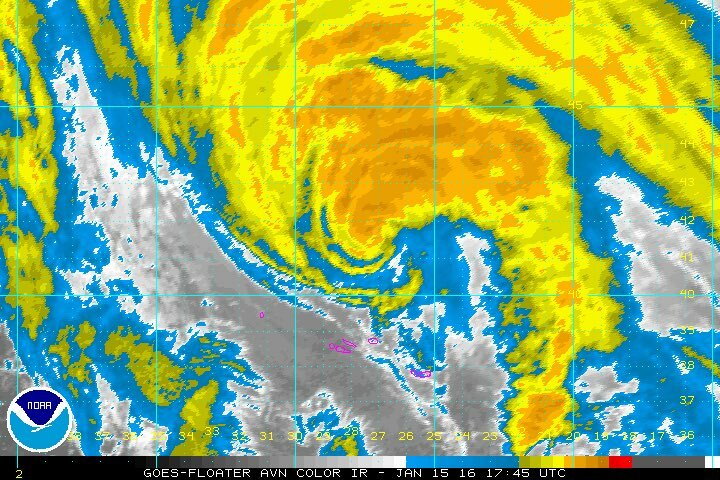 Anyone looked at the 6 hurricanes around Antarctica? Here’s your shot. But I’d like to let you know those storms raging around Antarctica are cold core systems — not hurricanes. They’re pretty amazingly strong though. Hurricane- strength at 930 mb, 960 mb, and 955 mb. And to see those kinds of storms during summer is pretty troubling. In layman’s terms, what we’re seeing is a pretty crazy battle between hot and cold going on down there. The warm air and warming oceans assault on Antarctica is underway. And it really generates some amazing storm potential energy. You now have my e mail please let me post. You’re go. Been having a bit of trouble with trolls lately so the new post approval has been slow. Goodness Thanks, I love you CBob!!! I love you too Mr. Scribbler, Redskylight Climatehawk Griffin andy in sd DT lange I cry as I post this, But know This!, you are all hero’s. Thank you! Anyone here pitching in to help stop this nightmare is a hero in my book. More brave than standing up against dragons. 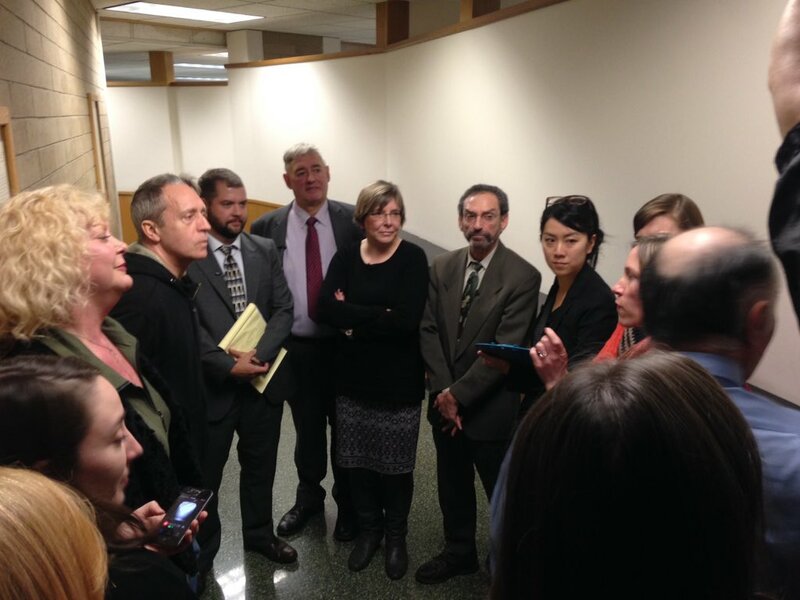 – Seattle oil train blockade trial.
.@dechristopher reports one juror in #delta5 trial just signed up for @ClimateDisobey Center. That’s good organizing! That’s a pretty amazingly clear precedent. Necessity defense. We’ll be seeing more of this. FAYOUM, EGYPT // The Middle East’s first climate change museum opened in Egypt on Thursday at the site of some of the most historically significant and visible signs of the phenomenon in its naturally occurring form. The museum is located in the Valley of the Whales, a desert area 150 kilometres south-west of Cairo, where whale fossils lie spread across what was once a seabed. “Although a retreating sea leaving behind whales was an undeniably dramatic consequence of climate change, a more significant change in Egypt’s history took place 6,500 years ago, when the winter rains that usually batter the Mediterranean coast and the Nile Delta began moving farther inland. On Thursday, Goldman Sachs announced it would pay a record $5.1 billion in civil penalties and consumer relief for its role in causing the 2008 financial crisis. According to a Goldman Sachs press release the Too Big To Fail and Jail bank will pay a $2.385 billion civil monetary penalty, make $875 million in cash payments and provide $1.8 billion in consumer relief. It does make you wonder though if the damages come anywhere close to the impact of this agency. More to the point, when are they going to fine the legislators who repealed Glass Steagall and set the stage for this mess in the first place. Welcome, Pretzel. Everyone pitching in to help set this mess straight is more than welcome. ahh, Zero 7, lovely stuff. I need a break from Bowie every so often! If only the temperature and sea level charts in this thread got the same sort of attention as the holy DJA. “Inverted priorities” hardly begins to describe it. Amen to that. I can’t believe the number of shows dedicated to just tracking the market. More like dedicated to the notion of wish fulfillment, really. Another great post, Robert. Good job staying on top of all of the recent unprecedented events occurring around the globe. It seems like things are spinning out of control, everything is happening so fast. The accelerated destruction of the Amazon in recent decades, combined with climate change, is really taking its toll on the forest. Sadly, it appears that the deforestation will likely continue, with new laws making it easier to destroy one of the most beautiful places in the world. Oil is down below $30 a barrel, and could go lower. Robert – You do the best job on the web of describing the ongoing human-induced abrupt climate shift. This article being a case in point. It prompted me to do a search for a graph of total CO2e over time. We have CO2 and CH4 data going back several hundred thousand years, but I could not find a chart of CO2e similar to the ones we’re all familiar with of CO2 and CH4 going back millennia. If you (or any reader) knows of one, or could create and post one, I believe that would be another useful tool in demonstrating just how far we have kicked the climate out of whack. Much thanks in advance and for all of your efforts.